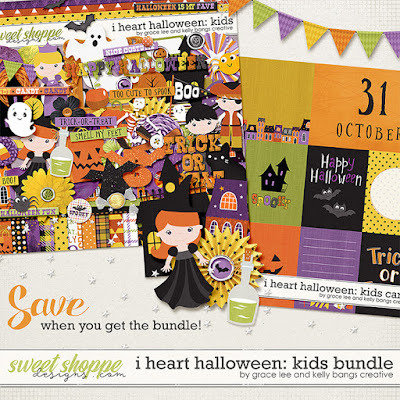 I Heart Halloween: Kids Bundle with Kelly Bangs Creative is all about tricks and treats. With cute little kids dressed in their Halloween best, candy and haunted houses, you're sure to find everything you need to get those Halloween photos scrapped. and 87 elements. The elements included are: bats, candy, black cat, costumed children, ghosts, haunted houses, spiders, web, unique word art and an assortment of beautiful flowers and foliage.